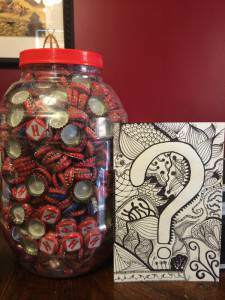 GUESS HOW MANY BOTTLE CAPS ARE IN THIS BOTTLE AND WIN FREE ADMISSION TO THIS EVENT! COMMENT BELOW WITH YOUR GUESS – PRICE IS RIGHT RULES – CLOSEST WITHOUT GOING OVER WINS! 2 Responses to "Paint Your Stein!"